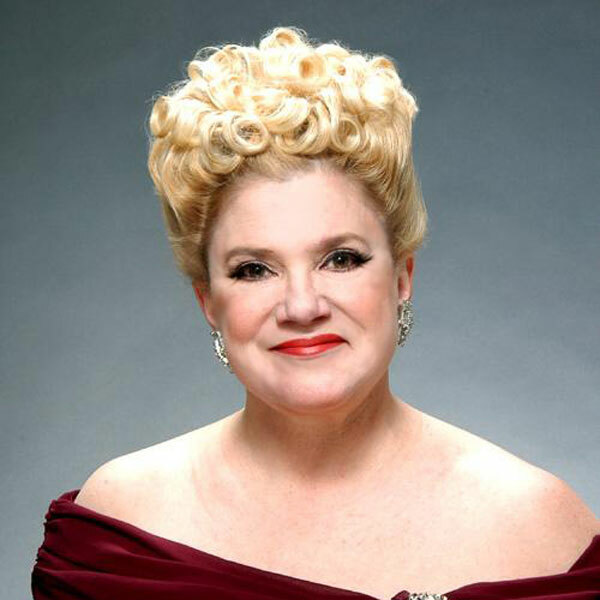 Sharon McNight made her Broadway debut in 1989 in “Starmites”, creating the role of Diva. She received a Tony award nomination as “Best Leading Actress in a Musical” for her performance, and is the recipient of the coveted Theatre Worlds Award for “Outstanding Broadway Debut”. New York magazine’s John Simon said “Sharon McNight is a winner” and Al Hirschfeld did a caricature of her. The singer/comedienne’s regional credits include Amanda McBroom’s “Heartbeats” at the Pasadena Playhouse, and an award winning Dolly in “Hello, Dolly” at the Peninsula Civic Light Opera (a role she repeated in her hometown, Modesto). Sharon was Sister Hubert in “Nunsense” in Los Angeles and San Francisco, where she received the Bay Area Critics Circle award for “Best Performance in a Musical”. She is the narrator of the documentary, “There That Night,” the story of the Provincetown, Massachusetts fire, and was featured in the A & E documentary, “It’s Burlesque”, for her research on Mae West and Sophie Tucker. McNight began her career is San Francisco where she received her Master of Arts degree in directing from San Francisco State. She taught a City College of S.F.. has been a master teacher at the Eugene O’Neill Center and is currently on the faculty of the Cabaret Conference at Yale University. She was recently chosen as one of the 50 most influential people in cabaret for 2010: – “A tireless performer who will drop everything to perform in any benefit with a cause, the Tony-nominated McNight can sing anything and make it her own” – NiteLifeExchange.com. She has played from Moose Hall to Carnegie Hall and anywhere the check doesn’t bounce. She has won six San Francisco Cabaret Gold awards, 3 Cable Car awards, a MAC award, a Bistro award, and received a Nightlife award from New York’s critics for her Best Musical Comedy show, “Ladies, Compose Yourselves!”, featuring songs by “living” female composers. Other songs include “Betty, Betty, Bette”, celebrating the screen legends Grable, Hutton & Davis; “Songs To Offend Almost Everyone”, a throwback to the party records of the 50’s mixed with political and social satire; “Gone, But Not Forgotten”, a tribute to the late ladies of stage & screen – Merman, Martha Raye, Madeline Kahn, Patsy Cline, & Judy Garland. In contrast is “The Sophie Tucker Songbook” which contains the music of the one-woman show based on the show business legend. The “Songbook” debuted at New York’s Rainbow & Stars as past of the ASCAP Sunday night showcase. Since then, she developed it into a one-woman musical, “Red Hot Mama”, which was workshopped at the Denver Center for the Performing Arts and Lucille Lortell’s White Barn Theatre, and finished a successful three month run Off-Broadway at the York Theatre. She has six solo recordings to her credit. Her eclectic repertory ranges from blues to country (yes, she yodels) to good old-fashioned entertainment. The Los Angeles Times call her “one of the great wonders of the musical stage”. She is most noted for her movie reenactment of The Wizard of OZ and for being one of the few real women to impersonate Bette Davis. As an only child, her parents kept her busy with all kinds of lessons: ballet, tap, hula, social dancing, flute and piano. She is single and lives in Hollywood. She has been the forefront in the fight against AIDS since the early eighties, and was featured in Randy Shilt’s book “And The Band Played On”. She was chosen twice as the honorary chair of the San Francisco AIDS Emergency Fund, and was one of two heterosexual women chosen as the Grand Marshall of San Francisco’s Gay Parade. She says the greatest day of her life was the day she quit smoking.